As you can see, the highest bidder (Advertiser C) is going to end up in the first paid search position. 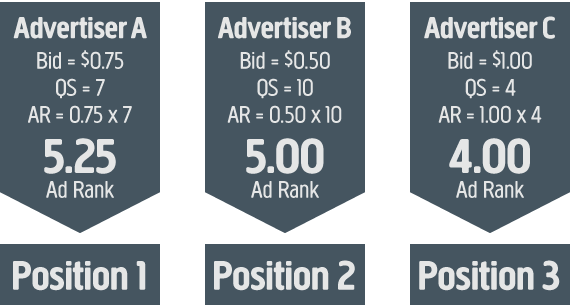 Advertiser A’s ad will show first and with a bid that is 25% lower than Advertiser C’s bid. 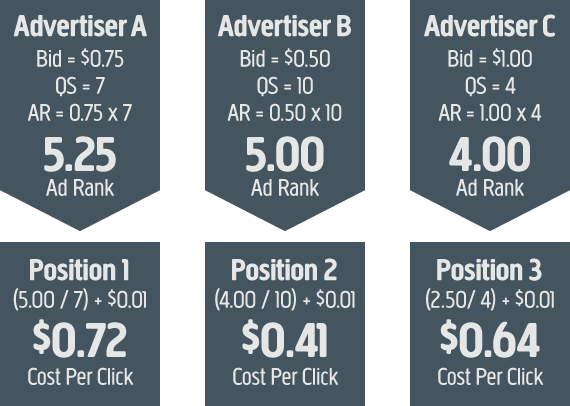 Although Advertiser A has the highest Cost-Per-Click to be in position #1 in this case, the really interesting observation is the relationship between Advertisers B and C. Advertiser B shows higher in the search results that Advertiser C, yet Advertiser B will pay less than half of what Advertiser C will par per click. This is all due to the fact that Advertiser B has a significantly higher quality score. 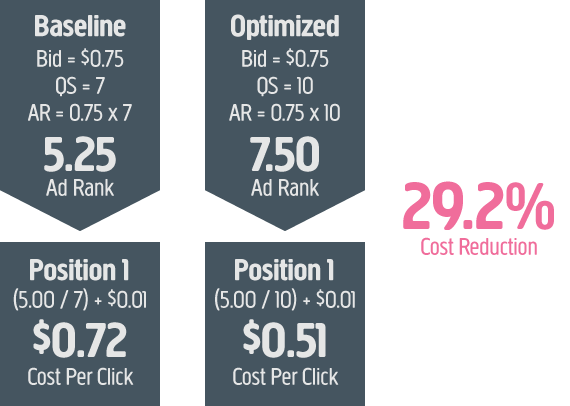 If Advertiser A raised his Google Adwords quality score to 10, he would realize a reduction in cost per click of nearly 30%. When you are dealing with budgets in the millions of dollars annually, that could make an enormous impact on the bottom line. Utilize multiple landing pages. The landing page should have a significant density of your target keywords for a particular ad group. If all of your ads point to your home page, you are probably doing it wrong. Include a clear call to action in your ad copy. This improves Click-Thru-Rate which improves quality scores over time.